Babygarten© story time is a fun and educational six-week series of classes for children 0-12 and 13-18 months. 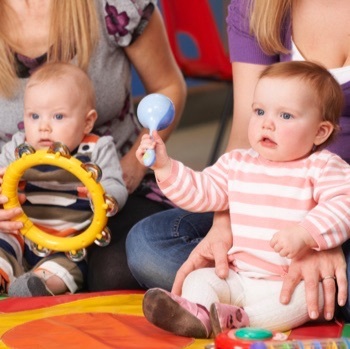 Each class involves songs, rhymes, activities and free play that help babies with language and pre-literacy skills. Most importantly, Babygarten© is a place you and your child can come to have fun together which is key to your child’s healthy development. Space is limited so registration is required. Please call the Children's Department at 817-427-6818 if you have questions or if you would like more information. Registration for classes in this session begins Monday, April 8 at 9:00 a.m. and ends Sunday, April 21 at 9:00 p.m. or when space is no longer available. Mondays from 10:30 - 11:30 a.m.
April 22 from 10:30 - 11:30 a.m.
April 29 from 10:30 - 11:30 a.m.
May 6 from 10:30 - 11:30 a.m.
May 13 from 10:30 - 11:30 a.m.
May 20 from 10:30 - 11:30 a.m.
Tuesdays from 11:30 a.m. - 12:30 p.m.
April 23 from 11:30 a.m. - 12:30 p.m.
April 30 from 11:30 a.m. - 12:30 p.m.
May 7 from 11:30 a.m. - 12:30 p.m.
May 14 from 11:30 a.m. - 12:30 p.m.
May 21 from 11:30 a.m. - 12:30 p.m.
April 22 from 9:30 - 10:30 a.m.
April 29 from 9:30 - 10:30 a.m.
May 6 from 9:30 - 10:30 a.m.
May 13 from 9:30 - 10:30 a.m.
May 20 from 9:30 - 10:30 a.m.
April 22 from 3:30 - 4:30 p.m.
April 29 from 3:30 - 4:30 p.m.
May 6 from 3:30 - 4:30 p.m.
May 13 from 3:30 - 4:30 p.m.
May 20 from 3:30 - 4:30 p.m.